Samsung's R-series offers good quality and features at affordable prices. The R522 is a mid-range system that features impressive quality, good usability and a true widescreen display. The screen measures 15.6 inches and features a 16:9 aspect ratio. As such, ﬁlms play back without intrusive black bars at the top and bottom. The 1366 x 768 pixel resolution allows space for viewing windows side by side when multi-tasking. 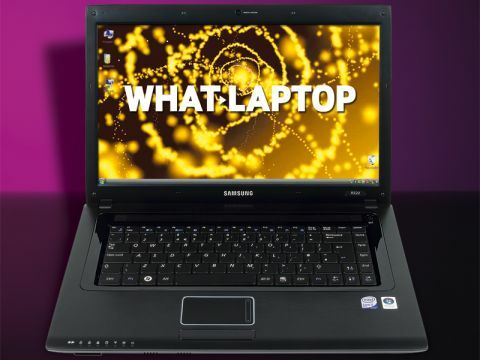 Unfortunately, this is as far as multimedia use goes, as the Samsung features the least powerful graphics card around – an integrated Intel chip. Those wanting a gaming machine should look elsewhere, although it's ﬁne for basic ofﬁce use or browsing the internet. This does beneﬁt the machine when it comes to battery life, however, lasting for an impressive 309 minutes between charges. Design-wise, the R522 bears a strong resemblance to previous Samsung laptops, while evolving enough to look fresh and stylish. You'll still ﬁnd the ﬁngerprint-prone glossy black plastic on the outside, but on the inside the brushed aluminum effect is attractive and hides grime well. According to Samsung, it is also spill resistant. The touchpad is surrounded by a bright blue backlighting, which thankfully turns off after a few seconds of inactivity, which is useful considering how intrusive it could be when watching ﬁlms. The keyboard offers a near identical typing experience to older Sony VAIO laptops, with large ﬂat keys that feature a raised centre to ensure typing mistakes are kept to a minimum. We found it a very comfortable board to use, but the keys do rattle rather noisily. We found this a smooth machine to use in daily situations, but it proved slower than others at a similar price. This is mainly due to the use of a 2GHz Intel Core 2 Duo processor which, although capable, is among the slowest you'd expect to get at this price. Multi-tasking is aided by a generous 4096MB of memory, however, which helps to prevent major lag when running intensive applications. The 320GB hard drive offers plenty of storage space. Costs have been cut when it comes to features, with Wi-Fi proving slow, and Bluetooth also omitted. Peripherals can be added via the four USB ports, however, and one USB port doubles as a high-speed eSATA port for backing up ﬁles to external drives. The Samsung R522 is a good laptop in most areas, but it's not a great one, with costs cut when it comes to features and multimedia power. That said, if you're after a semi-portable choice for the commute, the decent battery life still makes it well worth a look.